This CCPS Concept book shows designers and operators of chemical facilities how to realistically estimate the flammable mass in a cloud of accidentally released material that is capable of igniting. It provides information on industry experience with flammable vapor clouds, basic concepts of fires and explosions, and an overview of related computer programs. JOHN L. WOODWARD, PhD, is Senior Principal Consultant in the Process Safety Division of Baker Engineering and Risk Consultants, Inc. in San Antonio, Texas. He has been actively involved in consequence modeling for both the DNV PHAST and BakerRisk SafeSite codes for many years. He was invited by the GAO as part of a team of LNG experts to review LNG safety issues. 1.1 Why Calculate Flammable Mass? 1.2 How Are Flammable Mass Estimates Used? 2.3 How to Use Thus Book. 3. Industry Experiences with Flammable Vapor Clouds. 3.1 Property Losses from Vapor Cloud Accidents. 3.2 Examples of Vapor Clouds Events. 3.2.1 Bangkok, Thailand, LPG Vapor Cloud. 3.2.2 Saint Herblain, France, Gasoline Cloud, October 7, 1991. 3.2.3 Pampa, Texas, Hoechst-Celanese Explosion, November 17, 1987. 3.2.4 Monsanto Ethanol Explosion, Autumn, 1970. 3.2.5 Mexico City Vapor Cloud and Explosion, November 19, 1984. 3.2.6 Pasadena, Texas Fire and Explosion, October 23, 1989. 3.3 Examples with Postaccident Determination of Flammable Mass. 3.3.1 Fixborough Vapor Cloud Explosion, June 1, 1974. 3.3.2 Piper Alpha North Sea Platform Fire, July 6, 1988. 3.3.3 DSM Naphtha Cracker, Beek, the Netherlands, 7 November 1975. 4. Basic Concept—Fluid Flow, Fires, and Explosions. 4.1.1 Single-Phase Discharge Rates from Tanks. 4.1.2 Single-Phase Discharge Rates from Pipes. 4.1.3 Two-Phase Discharge Rates from Tanks. 4.1.4 Two-Phase Discharge Rates from Pipes. 4.1.5 Aerosol Formation and Drop Size Correlations. 4.1.7 Pool Spread and Evaporation on Land. 4.2.3 Surface Roughness and Terrain. 4.4.2 Flammable Limits with Inerts. 4.4.3 Autoignition Temperature for Gases. 4.4.4 Minimum Ignition Energy for Gases. 4.4.6 Laminar Burning Velocity and Turbulent Flame Speed. 4.6.1 Turbulence Effects of Jet Plume Ignition. 4.6.2 Turbulence and Pockets of Flammable Material. 4.8.2 Effects of Concentration on Explosion Overpressure. 4.8.3 TNT Equivalence Explosion Models. 4.8.4 Volume Source Explosion Models. 4.8.6 Determining Degree of Confinement. 4.8.7 Determining Level of Congestion. 4.9 Minimum Flammable Mass for Vapor Cloud Explosions. 4.10 Probability of Vapor Cloud Ignition and Explosion. 5. Determination of Flammable Mass. 5.1 Estimation Methods by Degree of Confinement. 5.2 Methods for Finding the Flammable Mass in Unconfined Vapor Clouds. 5.2.1 Screening Rules of Thumb. 5.2.2 Calculating Flammable Mass with Dispersion Models. 5.3 Methods for Finding the Flammable Mass in Partially Confined Vapor Clouds. 5.3.1 Estimating Flammable Mass for Potential Explosion Sites. 5.4 Methods for Finding the Flammable Mass in Confined Vapor Clouds. 5.4.1 Flammable Mass in Well-Mixed Room from Spill Outdoors. 5.4.2 Flammable Mass from Indoor Release in Well-Mixed Room with Low Ventilation. 6. Overview of Related Computer Programs. 7.1 Example 10, Unconfined Vapor Cloud—Vapor and Liquid Propane Releases. 7.2 Example 11, Unconfined Vapor Cloud—Effect of Wind Speed. 7.3 Example 12, Partially Confined Vapor Cloud Explosion—Vinyl Chloride Monomer Release. 7.4 Example 13, Partially Confined Vapor Cloud Explosion—Total Petroleum LaMede Refinery Explosion, November 1992. 7.5 Example 14, Partially Confined Vapor Cloud—Multiple Congested Areas. 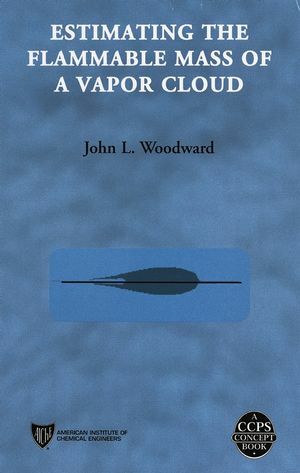 7.6 Example 15, Confined Vapor Clouds. 8. Recommendations for Future Work. 8.1 Calculating Flammable Mass Profiles Along a Vapor Cloud. 8.2 Resolving the Minimum Explosive Mass Issue. 8.3 Contribution of Aerosols to Explosive Mass. 8.4 Dispersion Modeling Around Plant Structure. 8.5 Improved Modeling of Jets Impacting Surfaces. 8.6 Models That Account for Turbulence Spectra. 8.7 Reconciling Indoor and Outdoor Explosion Models. 8.8 Calculate Net Efficiencies for TNT Equivalent Models from Historical Events. Appendix A. Atmosphere Stability Classification Schemes. Appendix B. Vertical Wind Profiles. Appendix D. Correlation for Flash Point. Appendix E. Polydisperse Drop Size Distributions. Appendix F. Multicomponent Pool Evaporation for Spills on Land. Appendix G. Generalized Indoor Concentration Build-Up or Decay. Appendix H. Calculating Concentration for Indoor Releases. Appendix I. Evaluating Flammable Mass for Gaussian Dispersion Models: Instantaneous, Point Source. Appendix J. Evaluating Flammable Mass for Gaussian Dispersion Models: Continous Release, Approximate Method. Appendix K. Evaluating Flammable Mass for Gaussian Dispersion Model—Continuous Release, Rigorous Solution. Appendix L. Numerical Integration to Find Flammable Mass. Appendix M. Expansion Velocity and Discharge Coefficients.